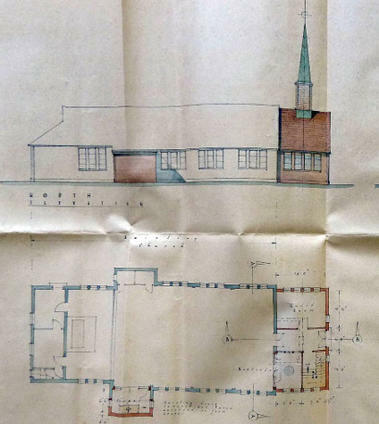 In October 1938, as the village embarked on a huge building programme, it was decided that a Chapel of Ease be provided for the Catholic parishioners. Tenders for the building work were received on 2nd September 1939, which, sadly, became the last day of peace before the Second World War. When the war ceased the plans were renewed and the first section of the building work commenced so that by 9th February 1952 a Chapel of Ease named St Therese of Lisieux was opened. More work was to follow so that the final phase was completed by Easter Sunday 1958 in what had become an established parish two years earlier. However, it was discovered that there was another church with this same name in a nearby district so the name was changed to St Bede. St Bede, a Benedictine monk and scholar born Northumbria 673- 735, was renowned for writing the Ecclesiastical History of English people. He was also attributed to be the first writer to adopt the AD (Ano Domini) dating system. It was on Easter Sunday, 1958, that the Parish of St Bede became a reality. The birth of St Bede’s came only after a long time in labour which had begun with its conception in October, 1938, when it was decided to provide a Chapel-of-Ease in Croxley Green. The site in Baldwins Lane was bought for £450, construction plans were drawn up and tenders were received on September the 2 nd, 1939. But the next day the storm clouds broke over Europe: Britain was at war with Germany and the Archbishop of Westminster, Cardinal Arthur Hinsley, ordered all work on churches and Catholic schools to stop. Discussions were revived within months, but with the need to Dig for Victory, they ended abruptly when the Council requisitioned the land for allotments. During the War years and after, Mass wassaid in a variety of venues, including Durrants School hall, Dickinson’s Instititute Hall and the rather grandly-named British Restaurant in Winton Drive. After the War, bureaucracy meant further delays, but on February the 9th, 1952, the completed building known as the St Therese of Lisieux Chapel-of-Ease was opened, with a 40-strong contingent of Scouts forming a Guard of Honour. The ceremony was performed by Bishop Andrew Beck, later to become Archbishop of Liverpool, who was a member of the Augustinians of the Assumption, the French order which had been the moving force in facilitating places for Catholic worship in Rickmansworth and surrounding areas since the beginning of the 20 th century. St Therese’s was the first of three chapels of ease to be built under the umbrella of Our Lady Help of Christians, Rickmansworth, the other two being constructed later at Chorleywood and Mill End. At the inauguration ceremony, the Rector of Rickmansworth, Father Evariste Buytaers, a Belgian born in France, paid tribute to the dedicated work of those who had raised the funds to realise “our dearest wishes”. The next morning at eight o’clock, the Rector celebrated the first Mass there and later High Mass was sung and relayed to the Chapel grounds for those unable to find room inside. Four years later, the Prime Minister, Harold Macmillan, declared that most British people had “never had it so good”, and indeed, the Croxley congregation was flourishing, with average attendances of 180 at Mass on Sunday. But there were further ambitions to be attained. The outstanding one, for the establishment of a separate parish, was duly realised on Easter Sunday, April the 6 th, 1958, on which must have been a cold weekend, since snow fell in some areas of England. With Mass previously conducted by a priest from Rickmansworth, Croxley now had its own parish priest, Monsignor John Clarke, a former principal Army chaplain who had served as a missionary in India. Amid the celebration, though, there was controversy. Despite the wish for more services, it’s perhaps surprising to learn that cutting the umbilical chord with Our Lady’s was not universally popular among Croxley Green parishioners. Even less so, it seems, was Cardinal William Godfrey’s decision to change the church’s name to St Bede’s, first, to promote devotion to the Venerable “Father of English History” and second, because there was already another St Therese’s in the area, at Borehamwood. “We were absolutely livid,” recalls one founder member. Monsignor Clarke made representations to Westminster, but to no avail, although a link to the original dedication is still retained by the statue of St Theresa above the entrance to St Bede’s, facing the altar. While Monsignor Clarke was not the last of St Bede’s parish priests to have to rely on his military pension, the change in status from chapel of ease to church also had financial implications. The chapel of ease had been used to stage fund-raising events such as dances, whist drives and bingo, but now Father Clarke was charged with the task of turning it into a place of worship bearing a more dignified, ecclesiastical appearance. To this end and with the help of parishioners’ contributions, 30 polished African mahogany benches were brought from Hearns of Waterford at £26.15.0 each, while gifts including Mass vestments were made by a Carmelite community and Our Lady’s Missionary League. St Bede’s now had two Sunday morning Masses and a Mass each weekday, with Benediction twice weekly. But while garden fetes could be accommodated on the site of the present presbytery and car park, now that it was a real church St Bede’s no longer had a hall for social events. The property at 118 Baldwins Lane was purchased as a presbytery, where a Miss Burns acted as a housekeeper, receiving her keep but no wages. 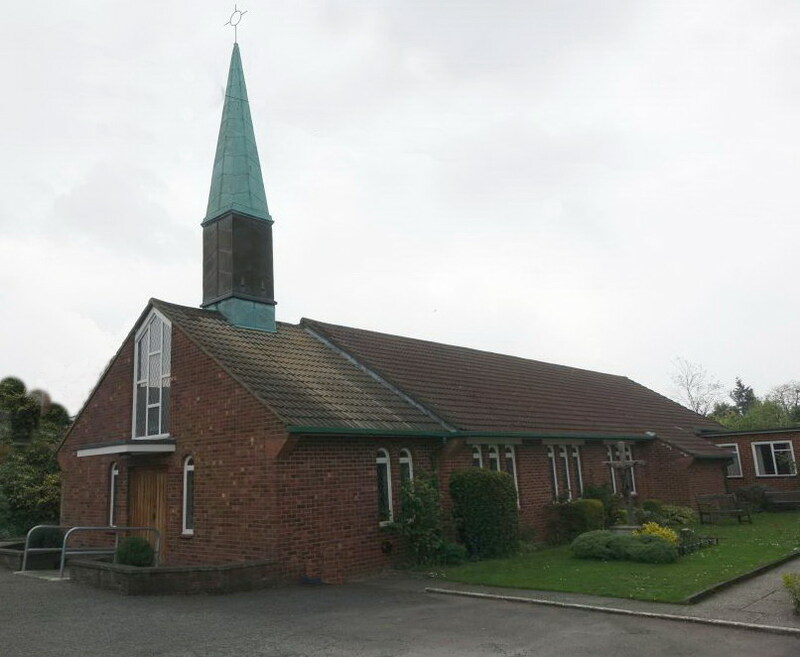 Monsignor Clarke cleared the plans for the present presbytery with the Town and Country Planning Authority, but permission for a church hall was refused because of the requirement for 20 car parking spaces – a problem even half a century ago. However, a bureaucratic loophole enabled the obstacle to be overcome by describing the present hall as a meeting room. Ill health forced Father Clarke to retire at the end of 1960 and he was replaced the next day by another former Army chaplain, Father Bill Campling, whose mother acted as housekeeper for him at 118 Baldwins Lane until August, 1961, when they moved into the newly-completed presbytery. Under Father Campling’s energetic leadership, significant changes were made to the appearance of the church. Among them was the moving of the entrance from the present emergency exit to one constructed at the rear of the church, while the building of a new Sacristy enabled the rear wall of the church to be extended to include the space previously occupied by the former Sacristy. But while various parishioners made generous gifts, there was no wealthy benefactor to pay for the improvements. Cardinal Godfrey allocated £5000 to the parish, but the cost of the new hall and other improvements meant a remaining debt of £16,000. There was a spirit of enterprise everywhere, though. The Union of Catholic Mothers had been formed in 1959, led by its president, Kathleen Farmer, secretary Stella Taylor Rose and treasurer Kitty Artiss; and in 1962, 21 members were enrolled in the newly-formed Guild of the Blessed Sacrament. More debts were incurred by a host of building works and additions, including the entrance pillars, the building of a Lady Chapel and the Stations of the Cross, but with a football pool earning at least £1,700 a year, substantial strides were made toward reducing the liability. A Sunday evening Mass was introduced in 1963 and the initiative of Pope John the 23 rd in seeking closer relations with other Christian denominations prompted the unprecedented presence of a group of Church of England parishioners from neighbouring St Oswalds at an evening Mass. It was, of course, a Tridentine Mass in Latin, but both denominations were as one in saying the Lord’s Prayer in English. When Father Campling departed for Berkhamsted, he was succeeded by Father John Clayton, whose 12- year tenure at St Bede’s is still the longest to date (at 2008). His housekeeper’s daughter, Betty Cobbett, was the church organist and also became housekeeper when her mother died. The gradual conversion to the new liturgy following the Second Vatican Council encouraged the introduction of several changes which have become integral features of St Bede’s, including the formation of a parish council and the use of lay readers in 1968 and, in the early 1970s, the first parish mission, the first service marking the Women’s World Day of Prayer and the first Harvest Festival. In the transitional stage toward the Mass resembling the form we know today, one long-standing parishioner, Jim Smythe, recalls that at a corresponding stage of the Mass, “people at St Bede’s might be kneeling, parishioners at Our Lady’s sitting and the congregation at Holyrood in Watford standing. The priest didn’t stand at the door to greet people after Mass, a practice adopted from the Anglican church, and while they said ‘peace be with you’, they didn’t shake hands. I much prefer the greater warmth now,” Jim said. During these years, a new Sanctuary was completed, and two leaded windows and two leaded windows which Father Campling had obtained from the chapel of Shrodells workhouse when it was demolished were replaced by two stained glass windows, each donated by parishioners in memory of relatives. Generosity was in abundance, in fact, with the gift by St Oswald’s of their organ and the substantial donation of a parishioner, Gerard Jones, to help clear St Bede’s debt in 1975. In May the same year, with St Bede’s debt-free, the church was consecrated by Bishop Christopher Butler, Auxiliary Bishop of Westminster and a prominent member of the Second Vatican Council. The parish held a celebratory dinner at Watford town hall three days later at a cost of £2.25 a head. step was taken toward sexual [gender?] equality by the introduction of women readers. No opposition to the move is recorded, but there were initial misgivings among some parishioners when his successor, Father John Dutton, initiated the Planned Giving Scheme, although the doubts were quickly dispelled by the obvious success of the scheme. Father Dutton also brought some uncertainty for parishioners on a number of Sunday mornings. The effects of medication tended to disorientate him: sometimes, he would be wide awake in the early hours of the morning yet, on at least one occasion, fell asleep in the Sacristy fully vested, just before 10 a.m. Mass. Priests have human frailties like the rest of us! Father Dutton made great efforts to establish a rapport with the young people of the parish and he left intending to train to be a teacher. However, he left after one term and spent years in the Amazon region of Peru. In 1979, diminishing resources led to the Assumptionists’ reluctant departure from the area, ending their remarkable 75-year contribution, but leaving an inspirational legacy. But the year also brought the arrival of Father Seamus Murphy, at 42 the youngest priest yet to be appointed to St Bede’s. He was a man of initiative. With the church and grounds now in need of attention, he formed the Guild of St Joseph the Worker, often taking off his jacket to set an example. The church organ had now seen better days and a replacement was obtained for £1,000, much to the satisfaction of the organist, John Strang, an accomplished musician. Father Murphy moved the baptismal font to the Sanctuary from the alcove where the organ now stands and commissioned an Austrian artist from Redbourn, Siegfried Pietzsch, to carve and decorate a statue of St Bede. On March the 28th, 1983, the church celebrated another milestone in the life of the parish when Cardinal Hume joined its silver jubilee celebration and blessed the new shrine to its dedicated saint. Coming from the North East like St Bede, the Cardinal said he found the occasion “totally compelling”, while also acknowledging that he had “a soft spot” for St Therese. There was now no parish debt and Father Murphy’s suggestion that some permanent form of aid be given to the developing world led to the forming of the Mission 100 Club. But in 1985, Father Murphy’s drive was needed elsewhere, and Father Andrew Clancy arrived in September, only to die suddenly in the Presbytery just six months later. Father Joe Caldwell assumed the pastoral care of St Bede’s until another parish priest, Father Desmond Baker, arrived a few months later. A year later, though, there was another incumbent. John Farrelly had been a schoolteacher in earlier life and had also been active in politics in St Albans, becoming the city’s first Catholic Lord Mayor since the Reformation. Unmarried, he had lived with his mother until her death, whereupon he decided on the religious life. It was he who introduced the practice at St Bede’s of gathering the younger children around him to share a few thoughts when they returned from catechism lessons. Father Farrelly had promised himself that in his final parish, he would erect a stained glass window in memory of his mother. His sudden death after a heart attack in May, 1990, prevented him seeing his wish fulfilled, but the window by Father Louis Norris of Buckfast Abbey eventually took its place of honour behind the altar, its symbols depicting the elements of the Eucharist. Money left to the parish in Father Farrelly’s will was used to purchase several items, including the celebrant’s chair and the free-standing candlesticks. During his time at St Bede’s, Father Cormac Rigby, formerly the presentation editor and chief announcer of BBC Radio Three, was ordained, the first parishioner of St Bede’s to become a priest of the Westminster diocese. His death in March, 2007, was to bring a host of tributes from people inspired by his intelligence and humanity. Another much-admired figure was Monsignor George Leonard, who became St Bede’s parish priest in June, 1990. He was well versed in journalism and performed an important role as advisor to Cardinal Hume in his dealings with the media. With Sister Christine Kawamoto, a Japanese-American who became parish sister, he introduced a system of various sub-committees. He also decided that nothing less than a complete refurbishment of St Bede’s was necessary, requiring its closure for six months, during which Mass was said at the Red Cross Centre. The refurbished church was re-opened by Cardinal Hume in May, 1992, and parishioners wasted no time in responding to his appeal to meet the cost of furnishings designed to enhance the atmosphere of the church, among them the Pascal candleholder and the stained glass windows in the sanctuary and by the font. Father George had intended next to concentrate on issues of spirituality, but he died suddenly while walking to an ecumenical service at the Methodist church in New Road. The packed congregation at his Requiem Mass at Westminster Cathedral and the evident sadness of Cardinal Hume underlined the high esteem in which his work and friendship was held. Faced once more with the untimely death of their priest, St Bede’s welcomed Father Bernard Lang in a temporary capacity and Sunday Masses were then celebrated by a succession of “supply” priests until the arrival of Father Bert Haines from Cricklewood in September, 1993. A warm, gentle man, it was appropriate that he was entrusted with the demanding task of responsibility for the welfare of sick and retired priests of the Archdiocese. He was later promoted to Canon and left the parish in September, 2000, when he was succeeded by Father Philip Cross, who also became a Canon while at St Bede’s. In March, 2006, a substantial extension of the hall was completed to meet the demands of a parish which was flourishing in the new Millennium, with founder members and St Bede’s stalwarts being joined by new families and new helpers in nurturing the spiritual community that provided the motivation of half a century ago. At the end of September, 2007, Father Philip became St Bede’s second longest-serving parish priest. He retired at the end of October 2012 after just over 12 years, and was succeeded in turn by Father David Kusi , on sabbatical from his own Diocese in Ghana.